Fiction books take up the top spots in many people’s reading lists. In fact, the bestselling books in all of history are almost all works of fiction. J.K. Rowling’s Harry Potter and George R. R. Martin’s A Song of Ice and Fire book series are just two of the many bestselling fiction books out there. There are numerous types of fiction books. There’s sci-fi, romance, fantasy, thriller, horror, and many more. Are you a writer who’s about to take the first step in writing your very first fiction book? Then, read on. 1. Read fiction books. A lot of them. How else are you going to know how to write fiction if you didn’t read fiction books in the first place? Not only will you learn how fiction is done, you can also get inspiration from all the books that you’ve read. However, always remember to never copy other authors’ works. 2. Gather ideas for your characters, setting, plot, etc. Since you are going to create a new world in your book, you are going to have to gather ideas. Through gathering ideas, you will be able to outline what the characters will be like, where the setting is going to be, and what the entire story is going to revolve around. Also, do your research as fiction must still be based on facts somehow. 3. Decide if you are going to write a novel, a short story, or a book series. You have to know your limits and where you’re going. It is better to decide which direction you’re taking before you start writing than changing directions when you’re halfway done with your book. A sudden change in direction can possibly cause inconsistencies and confusion in the plot. 4. Study human facial expressions and body language. Observe how other people react to different types of situations. Study the movements they make with their faces and with their bodies, and then describe these. Your readers will be able to feel the characters’ emotions by the way you describe their facial expressions and body language. Through these, you will make your readers understand what your characters are feeling, not through dialogues. 5. Be as creative as you can be. Your creativity can stretch from writing an eye-catching title to a life-changing plot twist to a mind-blowing story that will be forever etched in your readers’ memories. Don’t let anything or anyone hold you back. Readers love creativity in fiction and it is what can set you apart from the other books in your genre. Showcase your creativity through your characters, your setting, and your story, and surely, your book will garner plenty of readers. 6. Wrap up each chapter with a cliffhanger. Have you ever tried swearing to yourself that a certain chapter would be the last one for the night, but you end up reading three chapters more because you were curious about what happens next? Cliffhangers make readers keep wanting more; there is no doubt about that. Let’s take a character from George R. R. Martin’s famous book series as an example: Jon Snow. He is one of the most important characters in the series, but at the end of the fifth book, A Dance with Dragons… something unthinkable happens. Although his life seems to have been permanently altered, readers and fans refuse to accept it as final, for there is still so much more to his story. Jon Snow is a memorable character and all the readers who have been rooting for him want to know his fate. Because of this, readers cannot wait for the release of The Winds of Winter, the sixth book of the series. Even if you are not writing a book series, you have to make your characters interesting and memorable enough to make your readers remember your book as well. 8. Use real people as inspirations in creating your characters and real places as inspirations for the setting. If you’re having a hard time creating characters from scratch, you can get inspiration from the people around you. You can base the female protagonist on your strong-willed best friend, the protagonist’s love interest on her celebrity crush, or the evil villain on your mean next-door neighbor. It doesn’t have to be the names or the facial features. Your basis for the characters can simply be in the form of a talent, a skill, or whatever you can think of! If you’re creating a fictional world, especially when writing a fantasy novel, and you can’t seem to put the pieces of the setting together, you can use real places and then change the name or tweak its appearance. Problem solved, right? 9. Give your characters goals and desires. Let’s take another character from George R. R. Martin’s book series as an example: Arya Stark. She has a hit list (or a prayer, as the book calls it) – a list containing names of people who have gained her hatred. A list of people whom she intends to kill. And to tick off everyone in this list is her goal and desire. When you give a character a goal or a desire, your readers will root for this character. They are going to want him/her to succeed. Because of this, they are going to want to read your book to the end in order to know what happens to this particular character. It is a great way to engage your readers and get them hooked! 10. Make your characters suffer and then triumph in the end. You would want your first fiction book to make your readers feel good when they’re done reading, right? Give your character, or characters, a problem to solve or a challenge to face, and then make them come out of it victorious. Whether it is a heartbreak, a difficult quest, or a life-and-death situation; make it to a point that your readers can relate to whatever your characters are going through. If the characters triumph in the end, your readers may get a sense of hope from your book. Your book can greatly affect your readers’ lives in a positive way. Writing fiction is a creative process that requires effort, time, energy, and a whole lot of imagination. 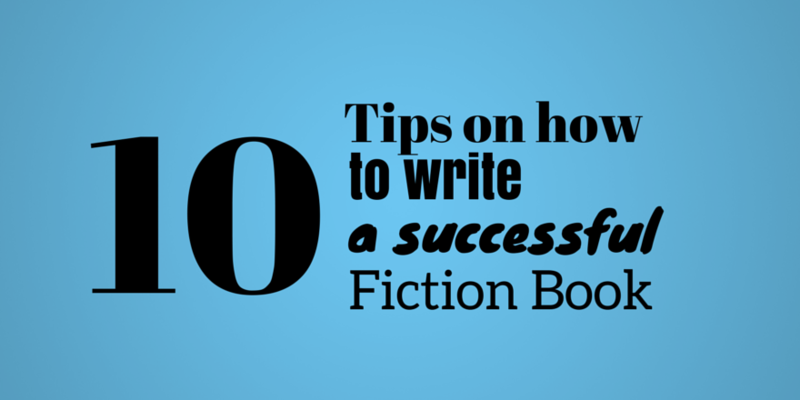 Do you have other tips on how to write a successful fiction book? Share your ideas! Post written and contributed by Jill Bennett, a marketing specialist of LitFire Publishing, which is based in Atlanta, Georgia, United States. For the past six years, she’s been working with several self-publishing authors in terms of book marketing, publicity and distribution. Jill has also written Google Plus Tips for Authors for the Short Story and Flash Fiction Society. Winner of Flash Fiction Contest #9! These are some good tips. I think short stories tend to work best for me. They’re not as daunting. Although, I hope to write a catching novel in my writing pursuits. Thank you for this blog post. Thanks for the comment, George! This article was focused more on novels, but the tips are still solid. So glad you’re writing short stories!